Cherry Mobile is one of the popular local mobile brands in Philippines that offers affordable price on their list of Android phones. To start year 2013, they release their first quad core phone for the price of below 7000 pesos called Flame 2.0. This was announced together with Cherry Mobile Omega HD phone that runs on Android Jelly bean OS that features 12 megapixels camera and Dragon Trail Glass technology. Two months later Cherry Mobile teases again another quad core phones now called version 2 of their previous model Skyfire. This device is powered by a Qualcomm Snapdragon quad core processor - also runs on Jelly bean OS and comes with a scratch resistant screen. Named as Skyfire 2.0 beefed up to 5-inch screen and 8 megapixels camera. 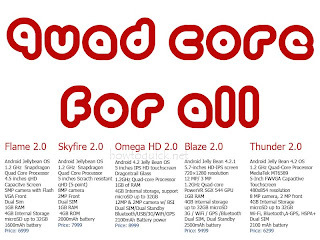 After Skyfire 2.0, Cherry Mobile surprisingly releases another 2.0 version of Omega HD with almost the same specs but now runs with a faster quad core processor. This was confirmed after some Cherry Mobile fans who already bought posted a photo of this new HD 2.0. As part of Cherry Mobile continuous effort of delivering the latest technology, this month the announced two affordable quadcore Android phones still under 2.0 line-up. 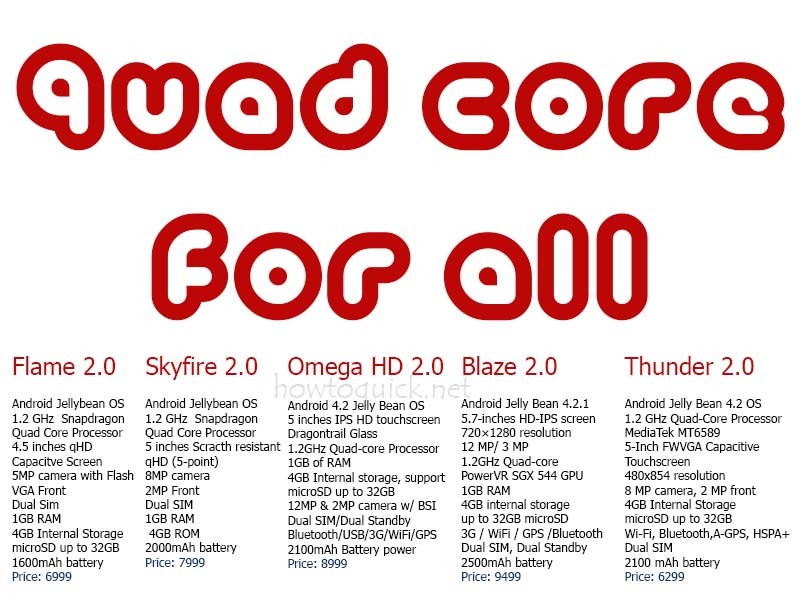 One of them is the cheapest ever quad core smartphone offered by Cherry Mobile which is called Thunder 2.0. The other one also is named Blaze 2.0 which has bigger or wider screen among other quad core phones. To sum up all those affordable Android Phones, we listed each other’s specs for you to compare and check the capability of the device before deciding to buy.